One of the most important areas of any production process is the ability to move equipment and materials easily from one person to the next in order to ensure that they will be able to carry out their work efficiently without having to waste time gathering things together. Utility carts are one of the main means for moving things around the factory or warehouse, and are a general piece of equipment that come in many different forms to cover various different tasks. You can get a number of different styles of utility cart to suit whatever cargo you need to move, and whatever kind of job that needs to be carried out. From light weight plastic utility carts that feature straightforward containers on a number of different levels through to heavy duty carts designed to carry a much heavier selection of weights. The most popular plastic utility carts typically boast 3 trays on different levels that are removable for loading and cleaning, and can easily be filled with whatever tools and equipment is required. These lightweight carts have four sturdy wheels, and can easily handle weights up to around 65 lb depending on the configuration of the cart that you choose. The trays are 24” by 36”, which leaves plenty of space for whatever cargo you need to move, and have a handy 4” lip around all fours sides to ensure that the load is unable to simply roll off when the cart is being moved around. Choose from either a two level utility cart that allows for plenty of space in the lower tier for bulkier items, and can carry a total of 47lb, or opt for the 34 tier design that carries up to 65lb, but will not allow as much space. As useful in offices as a mail truck as they are for moving light industrial equipment around a warehouse, your staff will find that the simple design with 2 swivel and two fixed casters makes the utility carts available from Easy Rack a useful addition to their standard equipment. Simple assembly, and a design that has been thought out to require very little ongoing maintenance mean that from the moment that you get the cart ready for service it will become a fixture in your facility, and soon pay for itself in view of the increased efficiency that it will offer for staff when they are moving equipment and items around from one location to another. Thanks to its rugged construction and stable design, the utility cart can be used almost anywhere, and for almost any light weight load, meaning that it is extremely flexible and can fit in with your plans from the moment it is ready to use. Although the utility cart is not really designed for heavy duty work, and can only carry relatively light weights around from one place to another within the factory or other working environment, you will still find that the sheer variety of roles that this small cart is capable of will more than justify your investment in it, not least because it will free up more expensive heavy duty carts for other work around the facility. As you continue to read through our selection of Utility Carts, keep in mind we stand ready to answer any questions you may have about our offerings. Call us at 1-888-776-3720 whenever such questions arise and let us help you make the best investment within your budget. We are located in Houston, Texas. 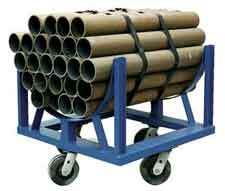 Applications for heavy duty stock carts vary widely according to the industries in which they are used. Medical facilities will use them to transport heavier pieces of equipment from storage areas to special care stations. Automotive shops use them to transport heavy engine parts to shop areas. 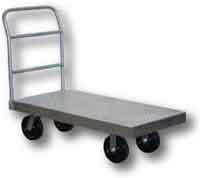 Folding carts are used for stocking and route delivery. They feature a platform that is guided by either one vertical handle on one end of the platform or two vertical handles at either opposing end. Most forms of welding require use of gases. And these gases usually come in large cylinders that are difficult to handle by a single person. 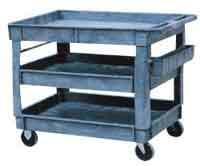 All steel utility carts share one common design element, which is that of a frame that rolls on four carts. Beyond this common denominator, designs vary greatly between models intended for various specialized tasks. There are carts that have built in hydraulic lift tables. 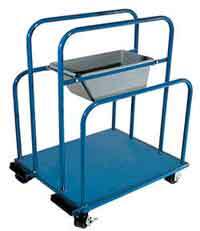 he double tray double basket utility mail cart is a cart with two baskets sitting on two trays. The baskets are both removable so that larger packages can be placed on the trays for transport. Having mobile carts in place for staff to move goods and equipment with will ensure that all goods into the business are treated properly, and safely. One of the main advantages that heavy duty, aluminum, metal, plastic & folding platform trucks have over other carts is the sheer size of load that they are able to carry. In outdoor environments such as farms, garden centers, and even construction sites where conventional industrial carts and platform trucks are not suitable, there is still a large selection of different garden carts available. One area that should never be overlooked when stocking a warehouse or store is the right kind of commercial carts for staff to use when moving items around, or filling orders. Industrial Carts. It is vital that the proper industrial & commercial warehouse carts are supplied in the workplace, and a culture of care is instilled to prevent accidents and injury. For light duty use throughout the workplace, rolling carts serve a number of functions, and are flexible enough for use in most situations. he main concern when buying any materials handling cart should be to choose the model that offers the best protection for both staff and the materials that are being carried.